Volkswagen Care Prepaid Scheduled Maintenance Plans. Volkswagen Care and Volkswagen Care Plus1 are available for purchase only at participating authorized Volkswagen dealerships in the U.S. Plans may be purchased either at the time of retail sale or lease of a vehicle or at any time before the first scheduled maintenance interval covered under the plan is due. It may be possible to finance the cost of a Volkswagen Care or Care Plus plan as part of your vehicle loan or lease,3 provided you make that decision at the time of purchase or lease. Consult with your dealership or financing source for details. COVER a range of manufacturer-recommended maintenance intervals. PROTECT you from natural price inflation with fixed parts-and-labor costs. DELIVER the expertise of Volkswagen trained technicians and the quality of Genuine Volkswagen Parts. PRESERVE your peace of mind and help protect your vehicle’s future resale value by keeping it properly maintained. For model year 2015 vehicles, Volkswagen Care covers the 20,000-mile and 30,000-mile manufacturer-recommended scheduled maintenance as stated in your vehicle’s USA Warranty and Maintenance booklet. For model year 2016 and 2017 vehicles, Volkswagen Care covers the 10,000-mile, 20,000-mile, and 30,000-mile manufacturer-recommended scheduled maintenance, as stated in your vehicle’s USA Warranty and Maintenance booklet. For model year 2018 and newer vehicles, Volkswagen Care covers the 10,000-mile and 20,000-mile manufacturer-recommended scheduled maintenance and Volkswagen Care Extra covers the 30,000-mile manufacturer-recommended scheduled maintenance as stated in your vehicle’s USA Warranty and Maintenance booklet. Volkswagen Care Plus Package 1 may be purchased for model year 2014 or newer vehicles (except for Routan). This plan covers the 40,000-mile and 50,000-mile manufacturer-recommended scheduled maintenance, as specified in your vehicle’s USA Warranty & Maintenance booklet. Volkswagen Care Plus Package 2 may be purchased for model year 2018 or newer vehicles. This plan covers the 60,000-mile and 70,000-mile manufacturer-recommended scheduled maintenance, as specified in your vehicle’s USA Warranty & Maintenance booklet. 1Limitations apply. Model year 2015 and newer Volkswagen vehicles are eligible for the Volkswagen Care plan. Model year 2014 and newer Volkswagen vehicles (except for Routan) are eligible for the Volkswagen Care Plus plan. Packages vary based on model and model year. Plan can only be purchased prior to the first scheduled maintenance interval covered by the plan. See dealer for model, mileage, and in-service date eligibility and complete plan details. 4Roadside Assistance provided by a third party. For assistance in the U.S., call 24-Hour Roadside Assistance toll free at 1-800-411-6688. When calling, please provide your vehicle identification number (VIN) located on your registration, insurance, or driver’s side windshield. No-charge towing available only to Volkswagen models under the new or certified pre-owned vehicle warranty. Call your Service Consultant or Volkswagen Roadside Assistance to see if you qualify. Serving the areas east of I-95 from Hollywood to Boca Raton! We know how valuable your time is - that's why we offer complimentary pick-up and return service with a scheduled appointment! All you need to do to eliminate the hassle of you having to drop off and pick up your vehicle for service is to simply schedule an appointment ahead of time. We'll come get it, service it and return it - what could be easier? *Must schedule your service appointment ahead of time with our service department. Must present offer at time of write-up. Not redeemable for advertised specials, previous purchases, or cash. Taxes, shop supplies and waste disposal fees extra. Coupons cannot be combined. Not valid for prior repairs or service. Not valid with any other offers. See our dealership for complete details. Applies to all tires in stock. Must purchase mount and balance, front end alignment, and the installation of Nitrogen. Directional, high performance, and SUV tires excluded. *Must present offer at time of write-up. Not redeemable for advertised specials, previous purchases, or cash. Labor additional charge. Taxes, shop supplies and waste disposal fees extra. Coupons cannot be combined. Not valid for prior repairs or service. Not valid with any other offers. Complimentary wash/vacuum included with any service visit. See our dealership for complete details. Let us help you drive with confidence. 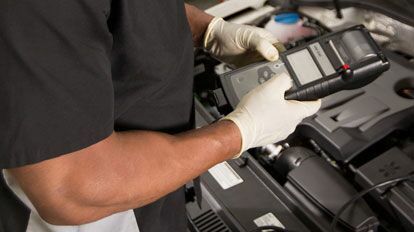 We will thoroughly review your major systems to ensure your vehicle is operating safely as well as ensure you are up-to-date on all recommended factory maintenance. If something is amiss with the systems we inspect, we'll let you know so you are aware. Repairs or additional diagnosis time at additional cost. Taxes, shop supplies and waste disposal fees extra. Coupons cannot be combined. Not valid for prior repairs or service. Safety inspection is limited to inspection report on file. Must present coupon at time of write up. We'll make your vehicle look showroom new. Our trained technicians will make your vehicle look like it just rolled off the showroom floor with this specially-priced detailing package. Let us get your vehicle looking like new today!